If you're looking for the best deals on Black Friday, look no further than your Facebook or Twitter account. Major retailers--including Best Buy and Toys R Us--are turning to social media to offer holiday shopping deals this year. Radio Shack is offering discounts to Foursquare users who "check-in" at their retail stores, while Sears is offering exclusive deals on Facebook. Sports Authority is even giving away $500 gift cards to users who "check-in" on Foursquare and then post said check-in to their Twitter account. Everywhere you look, big box stores and retail chains are asking you to "Like" their Facebook pages, follow them on Twitter, and check-in at stores using Foursquare. "Retailers are now aware they need to experiment with social media," explains Gartner research analyst Jeffrey Roster. Roster notes that Sears alone has nearly 20 separate Facebook pages, while Best Buy has six (including individual pages for music, gaming, and mobile devices). But this is just the beginning, he says. "What [retailers] are doing this year will be nothing compared to next year. Social media is evolving at near warp speed. Not because retailers are out in front of this--they are in fact racing to catch up to where their customers already are." It's not hard to see why businesses are lining up to engage with people using social media. Facebook, the world's largest social network, has over 500 million active users who spend a combined 700 billion minutes browsing the site, according to the company's latest statistics. That's a lot of eyeballs that could be searching for hot Black Friday and Cyber Monday deals, in addition to keeping up with their friends. 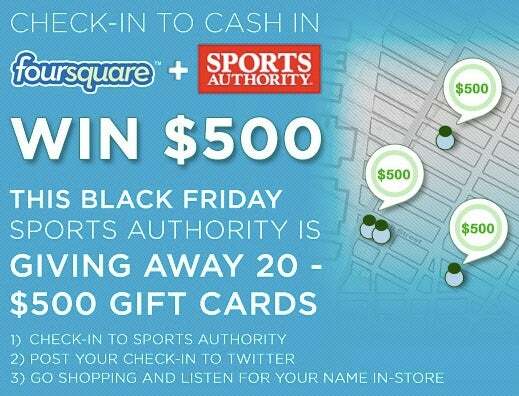 Sports Authority is giving away 20 $500 gift cards to Foursquare users on Black Friday. All you have to do is check-in to a Sports Authority location using Foursquare between 10 a.m. and 3 p.m. EST on Friday, November 26, and then post your Foursquare check-in to Twitter. If you win, your name will be called over the store's loudspeaker while you're shopping. 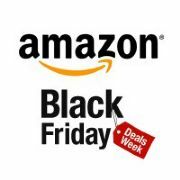 Amazon has been previewing Black Friday deals through its Facebook page and @amazondeals Twitter account. Keep your eye on both pages for upcoming Black Friday lightning deals. The online retailer is also giving away one Kindle every day until November 30 to people who "Like" the company's Facebook page. Starting December 6, RadioShack will start publishing deals on its Facebook page as part of its "Holiday Hero" campaign. 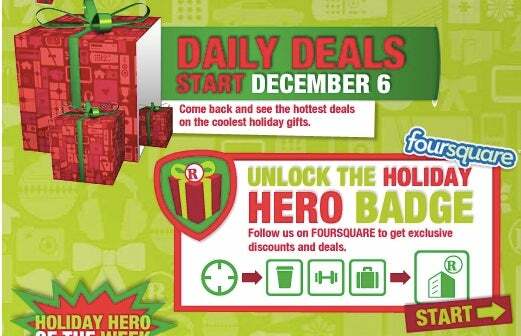 You can also follow Radio Shack's account on Foursquare to get special holiday deals--if you unlock the Hero badge, you'll get 20 percent off of select in-store purchases. All you need to do to get the discount is check-in to what the Shack calls "Holiday Hero Hotspots" such as a "gym (to stay in superhero trim), a coffee shop (to recharge your superpowers), or a place of transit (to zoom to unknown destinations)," RadioShack says on its Foursquare page. Then just check-in at a Radio Shack location after the other two check-ins to unlock the badge and get your discount. RadioShack Foursquare mayors can also get 15 percent off select merchandise. Mere mortals that don't unlock the Hero badge and who aren't RadioShack mayors on Foursquare can still get 10 percent off, just by checking in at a Radio Shack store. Starting at 9:30 pm on Thanksgiving night, the first 3,000 people to check-in to a Toys 'R' Us location on Facebook Places or Foursquare will get 15 percent off a future purchase (i.e. not on Black Friday) of $150 or more. Toys 'R' Us is also offering a sneak peek at its After Thanksgiving Sale if you "Like" the company's Facebook page.